Oops - we don't appear to have a video for the S400. 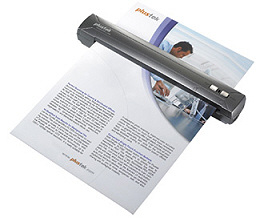 The Plustek S400 is an excellent portable scanner. The scan quality is excellent and the paper throughput has been very reliable in nearly two years of use. The software is comprehensive - a little ponderous at time but provides excellent support for two-sided scanning, automated straightening and variable scan quality. The word recognition for searchable PDF is first-rate on printed documents bot not on hand-writing. The MobileOffice S400 is a portable scanner for managing your business cards, organizing checks, receipts and expenses. With the press of a button, the Mobile Office S400 converts paper documents into Searchable PDF. ABBYY FineReader Sprint 9.0, in conjunction with Plustek¡¦s advanced image processing, provide accurate Optical Character Recognition (OCR) and reliable conversion to Searchable PDF and editable Microsoft Office formats. The Plustek MobileOffice S400 is designed with Business travelers in mind but it is rugged enough to be used in any vertical application requiring an easily transportable, mobile scanner.